This is a sponsored post written by me on behalf Cost Plus World Market. All opinions are 100% mine. I am so excited for the arrival of summer because it means gorgeous nights outside with our friends and family! We are lucky enough to have a patio attached to our apartment but we did nothing with it last year. Nothing! 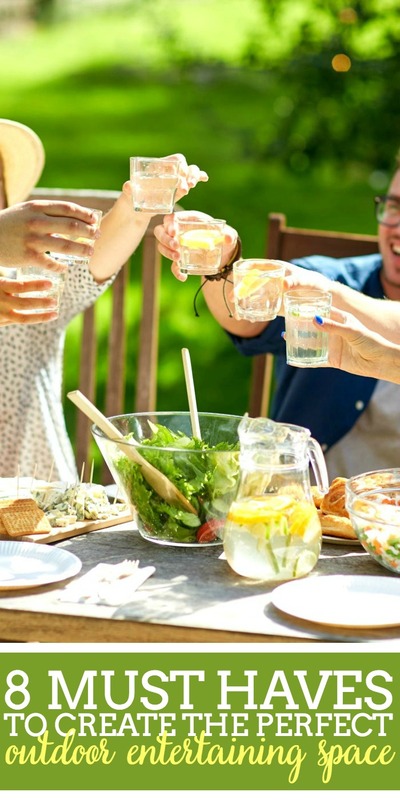 I have big dreams to spruce it up into the perfect outdoor entertaining space though so I thought I would share with all of you my must haves for hosting guests this summer. You can also check out this Cost Plus World Market summer guide filled recipes, style inspiration, gardening tips and more before you head into the store this weekend to get a 20% off coupon for your purchase! No one wants to be forced to sit on the grass (especially since I’m allergic) or on a concrete slab. If you are going to entertain outside, you need to have space for your guests to sit just as comfortable as they would be able to inside. Bring on my dreams for a fabulous outdoor couch and/or chairs. I’m personally drooling over this Gray Veracruz Outdoor Sectional Sofa from Cost Plus World Market. I love that it can be so easily customized for the size space that you have now and in the future, especially since we aren’t in our forever home right now. I can imagine us sitting around for ours chatting on this outdoor sofa. Of course I also want to be able to host dinner outside! When looking for my dream table, I want something that coordinates with my seating area for a cohesive look AND I want something simple to clean and care for. 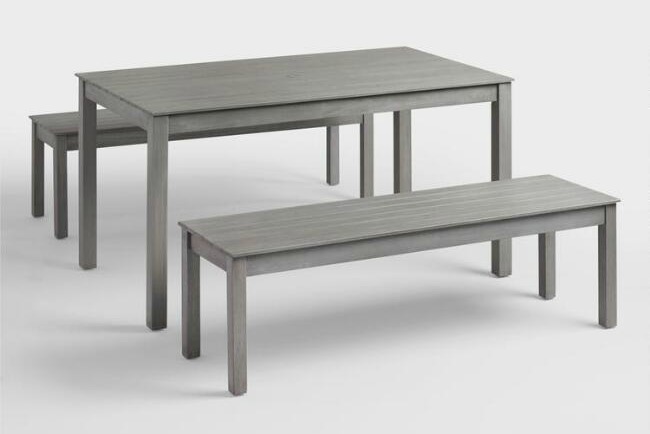 I’m personally loving this Gray San Pedro 3 Piece Outdoor Dining Furniture Set. I’d probably pick up a couple wicker chairs or something similar to be able to add to the end. 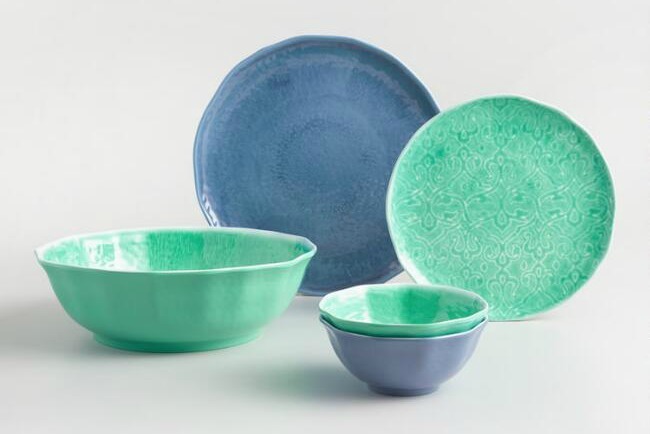 Add a pop of color with break resistant dishes like these Aegean Melamine Dinnerware in Aqua and Blue. The perfect water inspired summer colors! It just doesn’t feel like outdoor entertaining without a good summer BBQ! Having a good grill and all the great accessories to go with it makes summer entertaining much easier, and I would know because we still don’t have one! 😉 Nothing is worse than needing to turn the oven on in the summer time! I’m loving how affordable small grills are at Cost Plus World Market and am thinking I might head into my local store this weekend to pick one up! There is a GREAT COUPON….. I’m thinking this Tall Red Backyard Charcoal Grill OR this small blue one that is a Dual Electric and Charcoal Grill. It would be perfect if we ever wanted to grill on the go for a picnic! Plus – it’s blue! OF course I can also stock up on salt plates, cast iron pizza skillets, spatula sets, and everything else I need to grill up some tasty dishes this summer! You don’t want to entertain outside at night and have everyone sitting around in the dark! Beautiful lighting makes the space warm and inviting as well as usable long into the evening hours. 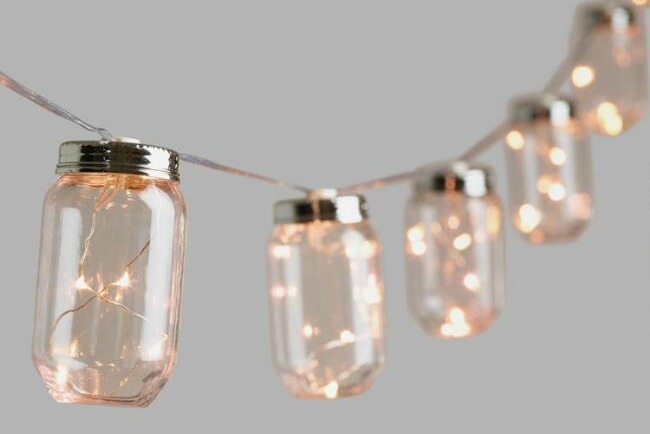 I’m always a sucker for the vintage looking industrial lights like these Edison String Lights, but really I want these Mason Jar Firefly String Lights! They are battery operated, too, which makes them super easy for us in our apartment space. They even have a matching Solar Mason Jar Firefly Lantern which would be perfect for lining a path, putting around the outside of the patio OR to put on the dining table in the middle! What is summer entertaining without a cool drink in your hand?! When I head into Cost Plus World Market this weekend, I want to pick up their Jalapeno Pineapple Cocktail Mix and their Spicy Watermelon Cocktail Mix! Yum! They also have a blackberry cocktail mix that is amazing!!! I love to even mix it with sparkling soda for a tasty mocktail. It’s me so, of course, I’m not just wishing and planning for the bare bones outdoor decor. 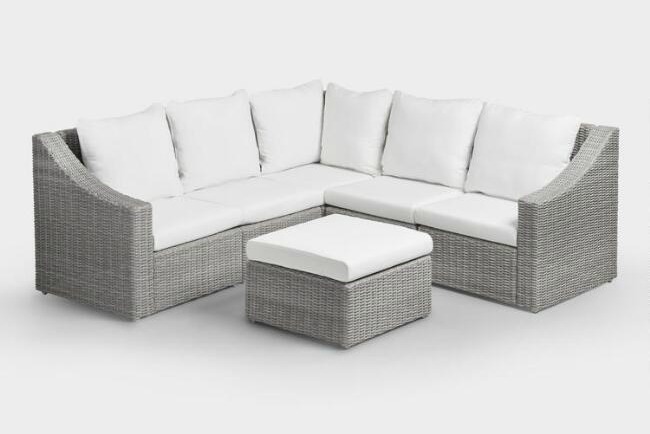 I want an outdoor pouf because they are cute and make great extra seating, I want LED candles because they are pretty without needing to worry about the wind blowing them out inside cheery lanterns or candle holders. I want colorful pillows that offer a great pop against the neutral outdoor furniture because it makes it easy to spruce it up and refresh it every year. 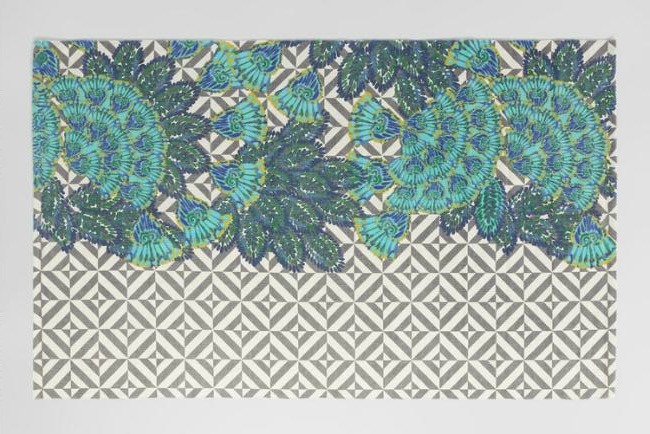 And I definitely want this Peacock Outdoor Rug which is also REVERSIBLE and goes brilliantly with the plates I want! We are a big game family as are our friends, so of course we need to add some awesome outdoor games and lawn games to our collection for summer entertaining. From Croquet to Bocce Ball and Ring Toss, Cost Plus World Market has me covered by having options for the big kids and the littlest of kids. I don’t think you can avoid having some greenery and plant life if you are hosting outdoors, but you can always make it super easy or fake if you have a brown thumb like me. 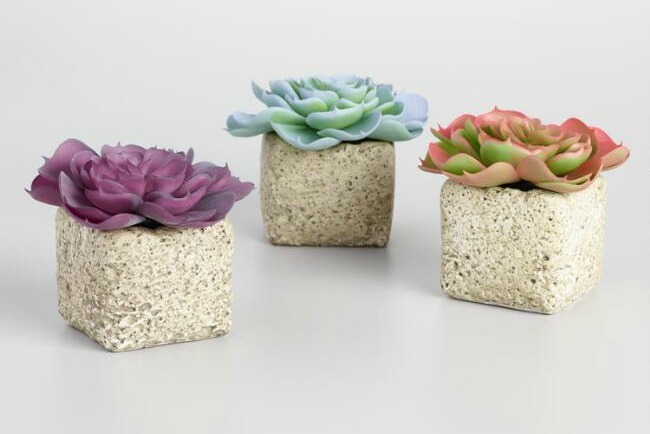 Personally, I want these faux pastel succulents for my outdoor patio and I definitely want to give the garden in a can a try. It seems easy enough, right?, and then I would have fresh herbs for cooking. I hope this helped you come up with some great ideas for refreshing your outdoor space! I’m definitely ready to start doing some shopping so we can make the most of these gorgeous warm days before Chicago Winter comes back around again. Definitely head into Cost Plus World Market this weekend. You can find your location here! I love my Kildeer location! They are handing out a 20% off coupon in store right now with 10% off food, wine and beer. Just ask an associate and you will receive! This offer is only valid in-store until 5/29 so if you want to save big this weekend, be sure to stop by your local Cost Plus World Market.